Deathlok (also referred to as Deathlok the Demolisher) is a fictional (Character) cyborg published by Marvel Comics. He first appeared in Astonishing Tales (Aug. 1974), and was created by Rich Buckler and Doug Moench. At least three subsequent Marvel characters have used the "Deathlok" identity since then. A recurring theme among these characters is that a dead human has been reanimated with cybernetic technology. "Deathlok technology" has also been used thematically by Marvel writers in other stories...More about Deathlok Character Review...keep reading !! Manning - Col. Luther Manning's body was rebuilt into a cyborg body by Harlan Ryker. 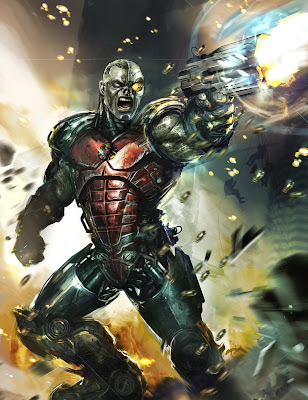 Deathlok's mechanical, cybernetic physiology granted him several superhuman powers including superhuman strength, stamina, agility, reflexes, and a computer augmented brain. The right arm and left half of his face are armored cybernetic implants. He wears a woven metal-mesh body suit of considerable durability. 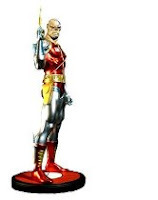 Deathlok also carried a helium-neon laser pistol designed by the U.S. Army of his time, and a throwing dagger. Manning was a military academy graduate, and a brilliant military strategist. He is a formidable hand-to-hand combatant, and proficient with knives, daggers, handguns, and laser pistols. He was later captured and upgraded by 616's S.H.I.E.L.D. and given jet boots that allowed him to leap at great heights and his other abilities were perhaps enhanced to greater levels. Collins - Michael Collins' human brain was transplanted into a cyborg body by a group of scientists at Cybertek. His cyborg body grants him the same powers as Manning, only with much greater strength, speed, and resistance to injury. He possesses a broad spectrum of visual and auditory powers. Deathlok has the ability to interface with virtually any computer system. He is also able to project his consciousness and sensory projections directly into the Net, making him able to executing a kind of direct hacking of computer systems far more efficient than a traditional computer hacking. His body can also target (nearly infallibly) multiple objects and track them. He could scan the entire electromagnetic spectrum, as well as enter computer systems. He has learned to use internal nano-bots to repair and alter both his organic and inorganic parts, enabling him to appear as either a humanoid cyborg, or completely human. He also has a very sophisticated A.I., capable of quickly making complex strategies and evaluating their chance of success. If requested, the A.I. can take control of the body to perform these operations. Collins himself possesses no combat skills, but under computer-guided combat routines, he is an excellent hand-to-hand combatant with an extensive database of combat techniques and strategies. Collins is an excellent computer programmer with an advanced degree in computer science and prosthetics, and helped construct the Deathlok body, along with other Cybertek scientists including William Hansen, Ben Jacobs, Stanley Cross, Dr. Hu, and Jim Dworman. 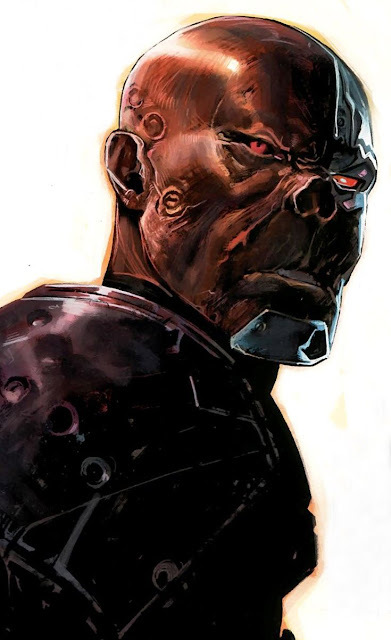 After becoming Deathlok, Collins later modified his own systems. Like Manning, Collins wears a woven metal-mesh body suit of considerable durability. He carries a plasma pistol which draws its energy from his internal power source. Thus, the weapon can only be fired if in contact with the outlets in Deathlok's hand. 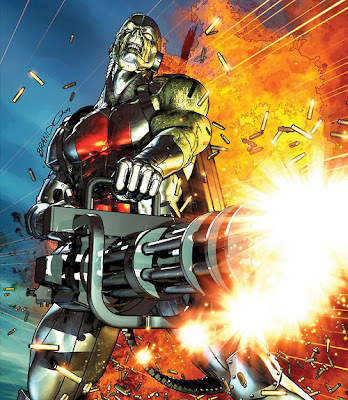 Deathlok also possesses a collapsible plasma rifle capable of greater firepower with the same limitations, a supply of fragmentation plasma grenades, and a molybdenum steel knife. He wears a wrist bracelet that allows Deathlok to override similar cybernetic operating systems, and an adamantium/vibranium alloy shock dampening helmet. He sometimes uses a refitted Cybertek Dragonfly fighter with a range of several hundred miles. In the early 1990s, a Deathlok film was at the script stage, with screenwriter Randall Frakes. 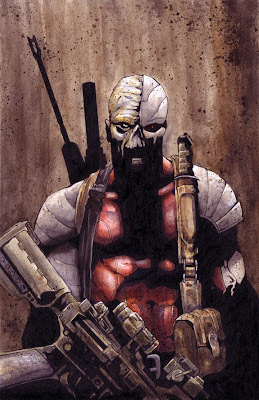 In 2007, a Deathlok feature film was supposedly at the script stage at Paramount Pictures, with screenwriter David Self. 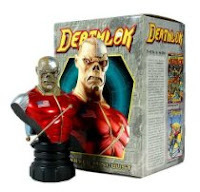 Looking for Deathlok Mini Bust from Deathlok Character Review Product (Amazon)..? click the picture below..